Valentine Day is a great time to remember the romantic movies we loved, or hum some heart-melting songs. Today I kept thinking about my mother's favorite shows. We used to watch them daily when she lived in her small apartment in assisted living. We started the morning with NBC TODAY show with Kathie Lee Gifford and Hoda Kotb. Mom would comment on their beautiful dresses more than she paid attention to what they said. Later we switched to "Who wants to be a millionaire?" with Meredith and Regis, and we'd try to answer the questions. During Mom's lunchtime, we watched reruns of her favorite comedy shows. Here is a trivia game to play for the chance to win my Valentine Babies. Can you remember what year these shows started? If you're too young to know, take a wild guess. Choose one of the years below. 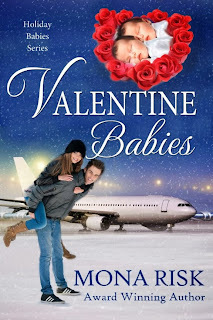 So go ahead, give me your answers to win a copy of Valentine Babies. VALENTINE BABIES is a heartwarming story that will take you from the heart of Kentucky to South Florida and Atlanta, and then to Iraq and Germany. Fearless reporter, Roxanne Ramsay, doesn't think twice before traveling for important assignments, even in a war zone--until her last trip leads her to a life-altering mistake. At his best friends' wedding, Dr. Greg Hayes, who has a serious phobia of planes, can't take his eyes off the lovely maid of honor. But why is Roxanne blinking away tears? Getting involved with the strong-headed and too generous reporter involves more complications than the bright doctor has ever faced in the OR. Yet what wouldn't he do to save the love of his life and her baby? Mona traveled to more than fifty countries on business or vacation. Eventually she left a scientific career to share with readers the many stories brewing in her head. She writes contemporary romances, sweet or not so sweet, with suspense elements or medical themes. Sprinkled with a good dose of humor, her stories are set in the fascinating places she visited, from exotic Belarus, and historical France, to the beaches of Greece, the monuments of Egypt and the mysterious Islands of Seychelles--or more simply in Ohio, Florida, Boston and Washington, DC. Her titles garnered many awards. A winner of Best Romance Novel at Preditors & Editors, Best Contemporary Romance at Readers Favorite, Epic Award Finalist, first-place wins in Enchanted Quill, Launching a Star, and Wallflower. Find Mona on Facebook, or Twitter, or visit her website. DOCTOR’S ORDERS Box Set: 3 romance novels, with emotion and humor. Christmas at the beach, on a cruise, or in Russia. HOLIDAY BABIES SERIES: 3 bestsellers novels, about Christmas and holidays, with twin babies and humor. FOREIGN LOVERS: a different genre of contemporary novels with sizzling romance, sensual tension, and suspense in international settings. Thanks for that trip back in time, Mona. I remember loving Bewitched as a kid and watching Golden Girls with my mom. I try to watch them whenever I need to have a good laugh and pretend I'm still hanging out with Mom! Hi Milou, that's exactly what I do now. My husband and I watched Everybody loves Raymond around 11pm. It gives us a few smiles before going to bed. It's fun to remember those old tv shows. They brought a lot of laughs. I always wished I could wiggle my nose like Samantha and just make things happen by magic. LOL! I can't formulate a guess for any of them. I haven't thought of those shows in so long, it's a nice reminder, Mona. Brought a smile to my face. I still like to watch Seinfeld for a good laugh. Some of the episodes were hilarious. Mona, I've had some favorites over the years that I've watched so much the bird reacts to the theme song! It's very comforting to have the familiar still with us, isn't it? I bet these old shows are still big money-makers. I wish our books could do the same with new editions printed now and then, and read by new generations. What a fun topic. I love the old TV shows. Good luck with the drawing, everyone!! I haven't even heard of some of those shows! Maybe they never aired in the UK. I have heard of Bewitched, of course. Wonderful show. I used to love it years ago.